As New World's founder, I have been privileged to help over thirty clients, in twenty sectors across fifteen countries to create value. Over the years a team of senior people have emerged who share a common view of the challenges facing you as a senior management team, and a belief that there is a different support model that can better help you to succeed. The New World team has over 200 years of combined senior management experience of creating real and successful strategic change. We all wear the "campaign medals". Everyone on the team is someone I would willingly turn to for assistance in their areas of expertise. 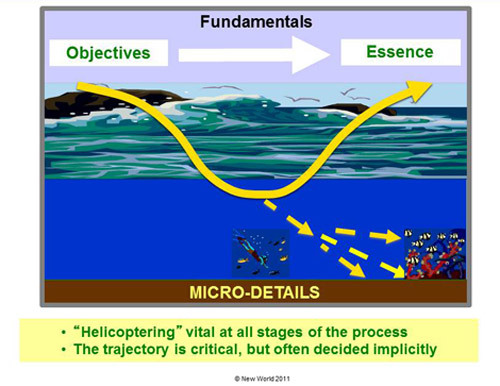 Our model of work is founded on two basic principles: 1) The aim of getting to Maximum Achievable Value Creation and 2) the importance of helicoptering back out of the detail of a problem to create a simple and clear essence of a solution. We are more than happy to talk through these two fundamental principles and how they are embedded in our work with clients.